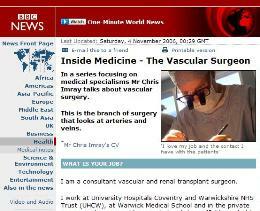 Welcome to the home page of Christopher Imray Consultant General and Vascular Surgeon. This site is primarily aimed at patients, but may be of interest to health professionals. This website covers a number of different subjects including general, venous and arterial surgery. It also contains information about high altitude disease. Viewers of this site should be aware it contains a number of graphic medical images.